Microsoft's Office 2010 choice screen which offers users the option of using either the open ODF format or Microsoft's OOXML has been published, but has already drawn criticism. The ever-excellent NeoWin has pushed out a picture of Office 2010's very own version of a ballot screen, with users prompted to decide if they want to use Office Open XML (OOXML) or OpenDocument (ODF) document formats, when they use the forthcoming software suite. Microsoft announced it would be allowing users the choice in their document formats last year, stating "Beginning with the release of Office 14 (Office 2010), end users that purchase Microsoft's Primary PC Productivity Applications in the EEA in both the OEM and retail channel will be prompted in an unbiased way to select default file format (from options that include ODF) for those applications upon the first boot of any one of them." The likes of Open Office and Google Docs are beginning to apply pressure – although not enough to really inflict any damage of Microsoft's favourite cash cow – and the need for open file formats that are readable by programs other than Microsoft's Office is clear if rivals are to begin to get market share. But the wording on the ballot screen has not, it seems, appeased all the critics, with suggestions that ODF is made to sound like the poor relation of Microsoft's OOXML. 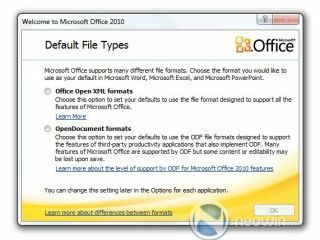 Currently the wording for ODL is 'Choose this option to set your defaults to use the ODF file formats designed to support the features of third-party productivity applications that also implement ODF. Many features of Microsoft Office are supported by ODF but some content or editability may be lost upon save'. It's a thorny issue, and not one that is likely to be resolved any time soon – but it's clear the current wording is not enough to appease critics of Microsoft.